Donna Shea outgoing president and John Tuggle incoming president. 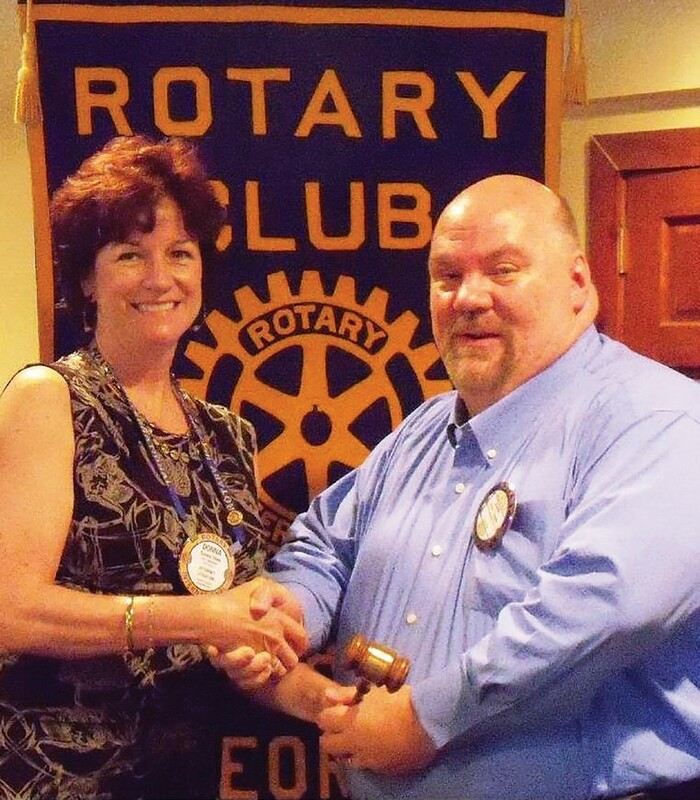 Club President Donna Shea, a former D.C. trial attorney, innkeeper, writer, and professional chef, led the Rotary Club of Savannah East to another banner year, including a Rotary District 6920 Gold Award for Excellence. Other achievements under Ms. Shea’s leadership included: Savannah East also reached a rare milestone– each member of the Club is now a Paul Harris Fellow; Savannah East started a multiyear project to bring clean water to tens of thousands of residents in the Chiquitano Forest through the exchange of Bolivian and Georgia professionals with exceptional knowledge and experience in the fields of health, education, computer technology, and clean water; and the Club staged a unique and fun-filled fundraiser which raised nearly $14,000 for literacy efforts in the Savannah area. The following officers were installed for 2013- 14 year: John Tuggle, Live Oak Libraries (President); Gena P. Taylor, Greenbriar Children’s Center (President Elect); Tom Hasse, Retired Military and Author (Vice President); Elizabeth Hancock, Coastal Georgia Accounting Company(Secretary); Bruce Montgomery (Treasurer); and Mel Mrochinski, (Sergeant At Arms). The Rotary Club of Savannah East continues to attract new members and welcomes those interested to attend a Friday luncheon meeting at the Pirates’ House. For further information, contact Barbara Settzo at savannaheast@yahoo.com or 912- 484-6069.